With the 7th Pay Commission being the last, a new formula would be in place from next year to review salaries of government employees. The Finance Ministry has made it clear that there would be no further pay commissions. The government took into consideration that the government should review salaries of government employees periodically instead of setting up a pay commission and waiting for ten years. How will government employee salaries be reviewed? The salaries of the central government employees will be reviewed periodically. It would not take ten long years to wait for a pay increase or revision in allowances or HRA. The government would review the salary looking into the data available and also based on the price index. The Aykroryd formula The government will take into consideration the Aykroyd formula while reviewing salaries of government employees. This formula would take into consideration the change in prices of the commodities that constitute a common man's basket. No more waiting ten years The central government employees will not have to wait ten long years for a pay hike. With then government deciding to scrap pay commissions, it will not have to wait ten years to set up one. 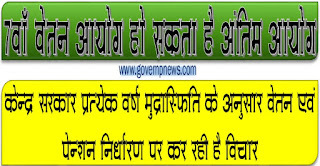 Pay hike every year There is every chance that the government employees may get a pay hike every year. The revision of salaries would depend on inflation every year. This would be applicable to the pension factor as well. Will the decision to make the 7th Pay Commission be the last make central government happy? Time will tell.